My luck ran out last night! I was on a ride fairly close to home, and got bit by a dog that I have had bark and chase me before, but never tried to bite! I was not really hurt badly, he did hit me hard enough to bruise my ankle, draw a little blood, and he hit my chain, and knocked it off the front ring. I usually carry pepper spray when venturing into unknown areas, but did not have it last night, and I probably would not have used it on this dog in time anyway, since I had dealt with him before, and did not consider him a real threat. I talked to its owner, and was assured he has had his shots etc. so I'm ok, but in the future I'll "shoot first" and ask questions later, pepper spray that is. I love dogs, I have three, but I'm going to really try not to get bit again. I live right on the TN/GA line and ride the rural areas near my home, dogs running loose are part of every ride. 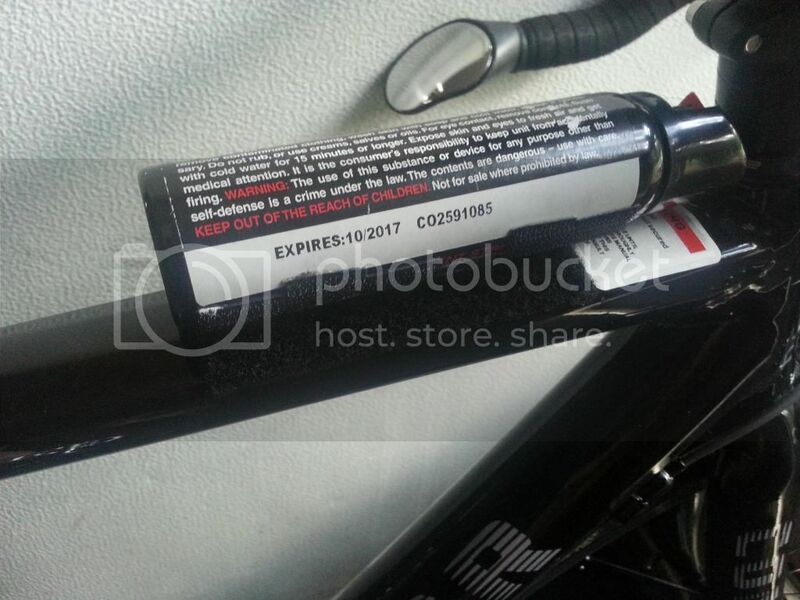 I can legally carry a ******, but somehow shooting it from a moving bike seems like a really bad idea, I'm going with spray, what say you? I say that it's a topic that's been rehashed dozens of times, but that, of course, will not keep it from being rehashed yet again, now. Yay. Good on you for sounding so calm about the whole incident. I would have been way more upset. Did you try waving at the dog? Sorry, I'm new here, and to road biking. No, it was partially my fault he got me, I have had him after me before, and he didn't try to bite. I was complacent, and was not even looking at him when he got me. I told him to be a good dog etc. and didn't give him another thought, well, until he bit me! Like I said, from now on if they're in the road and close enough I'm going to give them a little pepper spray, I won't be complacent again. I've had to deal with dogs on about every ride, even when I carry the spray I've never used it, but no more Mr. Nice guy! I live in the same area and have the same problems with dogs. I carry spray. how is it partially your fault that he got you? unless he was a stray this is all on the irresponsible dog owner. I am a dog owner as well, the "vicious man eating pit bull" as some of society likes to view them. I never have issues with my dog going after anyone. He never barks at cyclists, kids, or anyone else. He has never tried to chase anyone either. If a dog comes out in the road after me I dust them off with pepper spray. I keep a can of Sabre Red fastened to the top tube with Velcro. I can pull the can and flip the top on in a matter of seconds. Go for it with the pepper spray. The problem that I have had with it is that the stuff that works the best is the "bear spray" type canisters are too big and bulky to carry easily. They work great putting out a cloud of spray that doesn't require much aiming and will disable a dog for awhile. On the other hand, the light squirt ***-like canisters that are easy to carry are very difficult to aim accurately while riding a bike. They also don't put out enough pepper material to stop the dog instantly. I haven't been able to find a happy medium that works well but was fairly easy to carry. What's amazing and bizarre, and freaking stupid, is you aren't allowed to post that word on this website. I say partially, because I ignored him, I did not view him as threat because I had dealt with him before. We do have "leash laws" out here, probably the most broken law in the world! And yes I thought it was a bit silly that I can't type pi stol , even though I carry one. Ah, no it wasn't, but maybe a call to the authorities would be in order. Just so there is a record. @BillyD can you help this guy out? you should fill one of your bottles up with ammonia, or some sort of an acid concentrate just potent enough to cause blindness, but not potent enough to eat through the bottle. urine can also work sometimes, because when you squirt it in their eyes, it basically tells the dog "you're my b**** now"
personally though, the chemical way is so dull... soooo dull. I carry a large machete with me at all times. I like the way you have it attached, I'll likely follow your lead. Has it ever fallen off accidentally ? Maybe that's the real purpose of the urine pee tube in the other thread. For peeing on dogs ? After a run in with a huge Rottweiler on Memorial Day, I carry Sabre Red with the strap around my wrist. Hey Stumpbumper where are you located? Message me. I'm very near you, well I'm in TN not too far the GA line. Hey Rollie where are you located? Message me. I'm maybe near you, I'm in TN not too far the GA line. Lets 'em know who's boss. Don't forget to let the owner know as well. don't take the word of the owner who says the dog has had all the shots. get yourself checked out before you start foaming at the mouth.